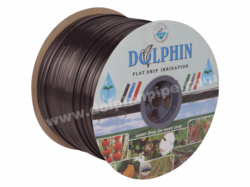 Our range of products include thin wall drip irrigation system, 16mm flat drip class 2, flat drip irrigation system and 0.2 mm flat inline drip pipe. Micro-irrigation is today’s need because World water resources are fast diminishing. 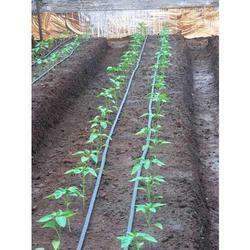 The one and only answer to this problem are Dolphin Drip Irrigation Systems. The name which you can trust, the only manufacturer of all drip irrigation components. 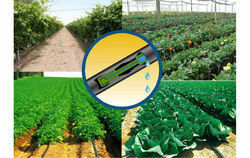 Emitting Pipe plays a key role in irrigation systems. We manufacture emitting pipes from virgin special grade polyethylene. Resistant to ultraviolet (UV) radiation and other environmental effects. Delivers uniform water flow into the roots of the crop via precisely punched holes. The Driptech tubing requires no expensive and complex emitters, eliminating the top cause for clogging. To adjust for the size of a land plot, a farmer needs to just scale up or down the number of Driptech rolls. Seamless drip tape with drippers permanently fixed inside. Seamless construction improves the ability to withstand pressure fluctuations. Manufactured from special grade, virgin polymer ensuring close dimensional tolerance and higher strength even at lower wall thickness. Manufactured with the most modern, state-of-the-art equipment. It’s computerized continuous online quality control ensures reliable quality and consistent performance. Hydraulically designed turbulent flow path emitter with a wide cross-sectional area and precision inlet filter that makes it truly clog resistant drip tape. Extremely low manufacturing coefficient of variation, CVm ensures high field emission uniformity. Available in 12, 16, 20, 25 and 32 mm nominal diameter as per metric standard. Available in four discharge rates of 1.2, 2.0, 4.0, 6.0 lph at the nominal operating pressure of 0.1 kg/cm² as per metric standard. Available in wall thickness ranging from 6 mil to 25 mil (0.15mm to 0.63mm). 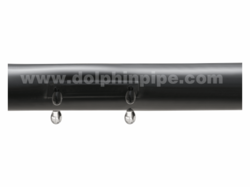 Available in standard dripper spacing of 20, 30, 40, 50, 60, 75, 90 cm. Any other spacing and group spacings are available on demand. Recommended for closely spaced seasonal row crops like sugarcane, cotton, chilly, potato, ground nut, onion, vegetables, oil seeds, banana, strawberry, floriculture, etc. Suitable for surface and subsurface applications. Available in four discharge rates of 2.0, 4.0 lph at the nominal operating pressure of 0.1 kg/cm² as per metric standard. our offered 0.2 mm Flat Inline Drip Pipe is used for providing inline irrigation to several types on crops in the agriculture industry. Known for their longer service life, error free performance, low maintenance, anti-clogging and dimensional accuracy, this array has gained a lot of popularity in the market. This flat inline drip is available in various descriptions as per the special needs of customers. 0.2 mm Flat Inline Drip Pipe is delivered to the customers in a stipulated time period owing to our expert logistics team.